The Slippery Jack mushroom or Sticky Bun is slippery or slimy to the touch. The cap is convex, brown in colour and can grow up to 12 centimeters in diameter. The pores on the underside of the cap are yellowish in colour and turn greenish as they mature. The stipe is a pale yellow and can grow up to 10 centimeters tall and 3 centimeters in diameter. The stipe is normally cylindrical but can have a "swollen" base. The underside of the ring is dark brown to violet after is separates from the cap. The flesh of the Slippery Jack does not bruise when handled. 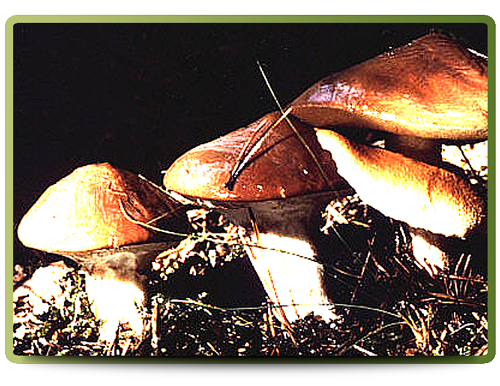 This mushroom is commonly found in pine forests following periods of wet weather.